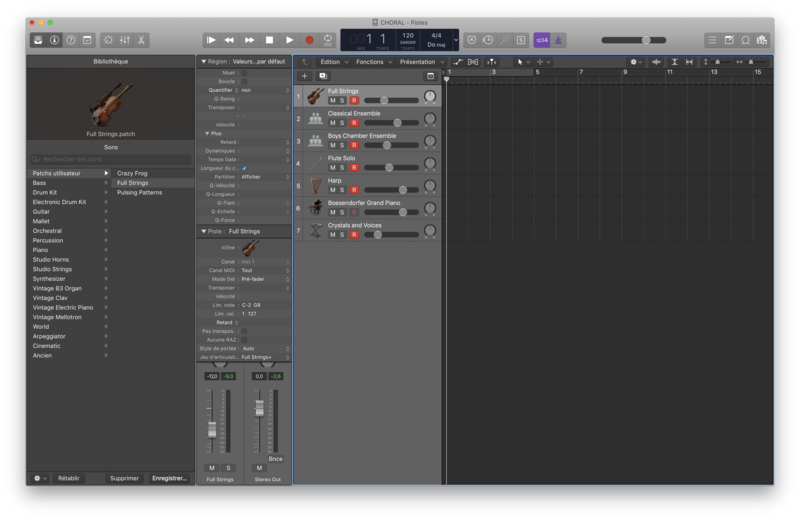 Logic Pro X, General Sequencer from Apple in the Logic series. beatsbyclos's review"Logic Pro X Review by C-Los"
Everyone says that Pro Tools is the industry standard. But for me as a primarily hip-hop producer, Logic is the logical solution. With this DAW you will be able to record, mix, master, create using MIDI, or even edit and sync video to music. You have over 200 tracks available for each session, 15 slots for plug-ins, and eight slots for your sends. This is enough to handle even the most extreme sessions. I’ve been using Logic Pro X for seven months now and overall I am very satisfied with the improvements from Logic Pro 9. I run Logic Pro X on two different Macs, one of them being my oldest and main workhorse, a late 2009 iMac 2.4 GHz Intel Core i7 with 8GB RAM with the MAvericks OS. Occasionally, I may have a buffering issue that stops playback, but simply pressing play again, my sessions will playback fine. I’ve also had sessions where I was pretty heavy on plug-in usage and my sessions were able to playback just fine. I use Avid’s MBox mini for my audio playback and microphone inputs, and they have worked flawlessly. I’ve also had the opportunity to produce a song where I had a guitarist lay down electric and bass guitar tracks using the stock amps and pedals that Logic offers. However, because Logic Pro X is now a 64-bit application, this could very well mean that you may not be able to use any of your previous 32-bit plug-ins (but there’s ways around that). If you have 32-bit plug-ins that you covet, I would consider researching solutions before fully committing. Another problem I have yet to figure out is the solo-safe feature. In my mixes, I use submixes to sum similar tracks to one fader. In Pro Tools, I gray (or disable) out the solo button on my submix auxiliary tracks so that even if I have to solo one or more tracks, they will still be heard. Logic offers the same feature, but it simply does not work like it’s supposed to. One feature I frequent often is Logic’s addition to Flex Time. 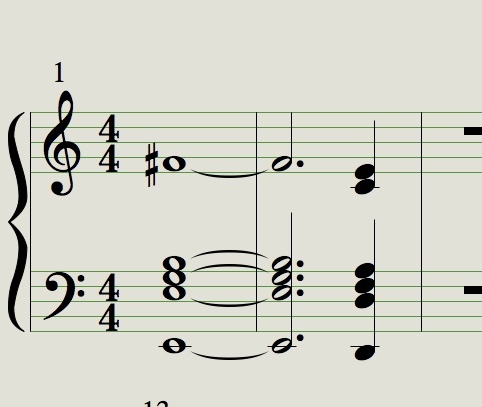 You are now able to adjust individual notes of singers with Flex Pitch. When activated, MIDI notes are created on the piano roll to reflect what the singer sung across the keyboard. 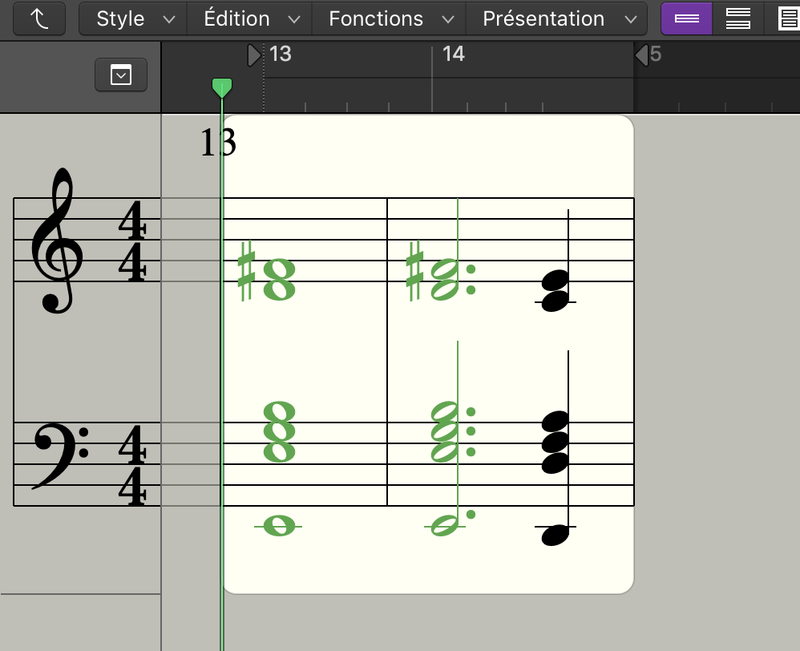 From there it’s quite simple to click and drag notes to their desired position. This feature is very similar to Melodyne, and really helps dial in those sharps and flats where redos are not an option. Another feature that is new to Logic Pro 9 is Track Stacks. Track Stacks offers a better way to help organize those big sessions by combining multiple tracks and managing them with a master fader. One way I find summing tracks to a “Folder Stack” useful, is stacking background vocals. I do this in addition to sending background vocals to their own submix for extra control. One feature I believe is underrated, is Logic’s new stock compressor plug-in. The compressor still offers the seven different modules within the compressor, but now some of the modules also have a distortion knob to help your sounds cut through the mix better. The VU-style metering also help give a refreshing look to the new compressor. Next, I found that Logic’s stock compressor also has a mix knob to allow me to do a bit of parallel compression, mixing the original unprocessed signal with the processed signal. Once I’m finished adjust parameters on the compressor, I can use the new output knob to boost or attenuate the processed signal’s level. I love Logic because it fits my needs as a creator of music. There’s plenty of loops that come stock to help spark inspiration, but Logic also offers some of the best stock virtual instruments I’ve heard from any DAW. Some say that “it’s not which DAW you choose, but how you use it.” But Logic Pro X is a music producer’s DAW. And if your plan is to produce music in any capacity, I highly recommend making the logical choice, and purchasing Logic Pro X for your studio. 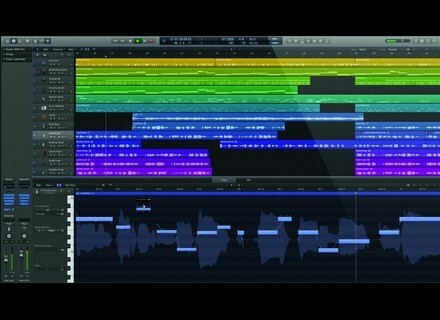 livewidmusic's review""Logic Pro X, an end to Logic ?"" Logic Pro X as the Apple website clearly states "The most advanced version of Logic ever" (which I completely do not agree with and we will come to that shortly) is the latest digital audio workstation in the Logic family, for songwriters and engineers. Compose, Record Audio, Play Midi, Edit, Flex, Mix, Master and Bouncing are the main core features that Logic X provides, similar to any other DAW out there. With a download size of 828MB directly from the Appstore and an extra 35GB of additional instruments, plugins and loops, this "64-bit only" Logic X runs on smoothly from OS X 10.8.4 or upwards with a minimum of 4GB RAM. Logic X supports 255 audio, software instrument and auxiliary channels with unlimited number of midi tracks, with 15 plugin slots and 8 effects send slots for each channel strip. Since I have given a quick positive introduction to this new version of Logic (for those who are new to Logic X), having used Logic Pro 9 for the past 6 years, I have to sadly say that Logic X is a clear disappointment for Logic Users. The reason why I am mentioning only "Logic users" is because I am pretty sure Logic X's initial customers/clients would be previous owners of Logic 9 or earlier. Being one among them and seeing other users around me, first and foremost, the initial setup does not include a .DMG file, rather, the installation and download process is done directly via the Apple Appstore. The Initial install takes around 2GB space on the system and then another additional 35GB content needs to be downloaded (this will take time but you can resume your work with Logic X minimising the download window) to get Logic X in its full shape. The Manual is clear by its own terms. The Key commands have changed for certain functions, which is very irritating for professional musicians and producers. When you call it a new version, you never expect the key commands to change. This takes time off from people and lead to confusion. Sadly, I got used to the new key commands, even though I later started using the old Logic 9 key commands on Logic X, as it was not working and slowed me at times. Logic X being 64-bit supports only 64bit audio plugins and virtual instruments. Another Headache. Opening Logic 9 sessions (Logic X supports sessions from Logic 5 and upwards) on Logic X might look very cool. But when you start playing the session, you face errors and pops. Audio regions are sometimes mis-placed. 32bit plugins seems to work with the Logic's built in audio bridge for 32bit to 64bit. But this is only for certain plugins, and there it is finally - "Your first Crash" . The new "Auto save" feature is a great help. But I don't think anybody would want to keep re-visiting previous auto-backup save sessions every 5 minutes? you will definitely enjoy the look and design of it. Previously I was using OS X 10.7 (Lion) with Logic Pro 9. Though the Lion OS itself was a disaster to my working environment, after clearing all the hurdles and successfully solving the compatibility issues, I continued my work on OS X Lion version itself even after the Mountain Lion had arrived. Usually there is a say "If something works for you, don't update". I should have listened to this advice when I moved to Mountain Lion (I like things to be updated always). The sole reason for quickly moving onto Mountain Lion was Logic X, as it only supports from OS X 10.8 onwards. At the moment, Logic X 10.0.7 runs on my 8 GB, 2.8 GHz Core 2 Duo, Mavericks (10.9) system. Its been 1 complete year after getting Logic X and so far, other than constant crashing and certain sessional related defects, that me and many of my friends have still not found answers for, Logic X runs seamlessly faster and is very powerful in handling complicated and hybrid sessions. The Audio engine is updated. The usage levels of the RAM and the processing speed of plugins are slightly lesser and faster respectively. After switching to Logic X, the performance I receive is sometimes noteworthy but most of the time, it gives me only issues. Let us put it this way. The more size and larger the session is, the more amount of problems occur. With a lot of newly added features, notably like the "Flex Pitch", "Track Stacks", "Drum Kit Designer", "Retro Synth" and the "Smart Controls", Logic X attracts many of us and gets along easily with these problems mentioned earlier. The "Flex Pitch" as you would have already understood is a new addition to the flexing options. Now you get to flex any audio signal inside your session. Though I would say Logic X does a good job with flexing (This looks almost like Melodyne to me but not that accurate though), it is not stable at times. With a large audio file, for e.g., 5-10 minute long file takes up-to 5-10 minute itself for processing before one could start flexing. To avoid this situation I usually slice the audio regions and put them onto a separate track just for flexing purposes. Here is where the "Crash" sometimes arrives. When such a large file is duplicated, Logic X starts to become a child by itself and panics. The playback stops abruptly at many times when the Flex option is active. As you all might be wondering now if this could be my system configuration's issue, which I also though initially, I was wrong when I found out that many users encounter the same problem. I was forced to flex the audio signals on a separate session or via another program/software. "Track Stacks" is awesome! This was something I was looking forward to earlier itself. To have a folder within the arrange session, and to control all the instruments with just one slider was a relief, especially for Logic users. Though this is possible by just bussing all your wanted tracks to an auxiliary channel, here, Logic X provides you an instant time saver. Select all the tracks, right click and enable track stack, and all the tracks become a single folder with one slider. Don't get confused. This is not the Folder feature we had up-to Logic 9, where the tracks hide themselves inside another separate window. The "Drum Kit Designer" is attractive but sometimes rules over us giving us more than what we ask. With several custom preset - customisable drum kit designs, this is an easy solution for Producers. With some industry leading drummers around the world, Logic X has incorporated their involvement in the playing and groove styles giving you a virtual drummer with its own mix setup. Feel free to tweak the settings. If you have a verse - chorus - verse structure for your song, the drum kit designer immediately recognises this and gives you a series of drum patterns accordingly. The "Retro Synth" is something I loved. A completely new re-touched collection analog and dirty synths have arrived. The settings are quite similar to every other synth based instruments. "Smart Control" is a completely new feature and very much well-thought insertion. It allows you to globally control all the instrument plugin's basic function knobs - all in one - window. This is completely helpful, as you do not need to individually go over each instrument to tweak the settings on a general level. 1) Constant and unexpected crashes at the middle of sessions. 2) Last saved sessions deliver audio cross fade-pops at times. 4) 32 bit only plugins - Good bye, or use 3rd party applications like SoundRadix to get them on Logic X. Re-starting the AU manager on any previous Logic Pro and then opening Logic X sometimes solve this issue. 6) Slicing, editing and aligning regions sometimes gets snapped onto wrong time-lines, even though "snap to absolute/relative grid' is enabled. 7) The mouse pointer is un-recognised on the region window if you need to click on an empty space. Now you are forced to click on the play-head time line. For $199.99, Logic X is a satisfactory - painful welcome into your life. I have not noticed any difference in the quality of sound when compared with previous versions of Logic. The production and the outcomes are the same in terms of both sonic quality and sound. Being a die-hard Logic user for several years now, I would have anyways purchased the Logic X - be it good or bad (This is the selling point, as a previous user of a software, especially like Logic, is always naturally excited to experience the latest update of it). But now, to be frank, I don't use Logic X for professional dead-line based projects, keeping in mind some of the scares on my client's face and mine earlier, while using Logic X, I have finally moved back to Logic 9 for constant work-flows, keeping Logic X only as a back-up. and for experimental projects. - Were there any compatibility issues? Not at all, it worked straight away with any audio interface I've ever plugged into the mac. Logic Pro X doesn't like the 32bits plugins anymore, though, so if you have many of them it might not be your best choice for a DAW (unless you want to use stuff like jbridge... personally I like to keep things simple). - Is the general configuration/setup simple? Very. All you have to do is download it from the AppStore. The main package is pretty small, and if you want to use the extra stuff (wich is a lot) it asks you to download it separately as soon as you click on a preset or open a project that needs something you didn't install yet. But in my opinion the best you can do is just go to the 'download additional content' menu, click on everything and let it sort things out, so you don't have to even think about it anymore. - Is the manual clear and sufficient? - Are the typical functions easily accessible? To be honest, I've never read the manual. This is a good thing. - Does the software work correctly in this configuration? - Is this configuration (software and gear) stable? Works really well, never had any problem with interfaces or plugins (I don't use many third party plugins, actually, but anyway...). I'm on a mac book air - the cheapest one, 2014 i5 1.4Ghz, 4gb RAM - and it runs smoothly here, even with around 40 tracks on a project and many plugins on tracks and buses and etc. So far I didn't have to freeze tracks or anything to be able to work. I've even tried opening a project from an external USB 3.0 drive, with no problems at all. I make soudntracks for videogames, so what I like the most is definitely the sound library and it's hundreds and hundreds of loops, all the presets, and stuff like 'drummer' that Logic has. Its always easy to quickly get an idea from your head to the computer, and give it some polishment later by tweaking what the presets already gave you. On the other side, some virtual instruments haven't been updated since Logic 9. The strings are weak, so are the brass sections... I like the drums and the synths, but if you really need to make people believe that those instruments are real, you better get some other libraries. Apart from that, all the MIDI editing is pretty easy to do, the interface is clean and organized and once you learn (or customize) some shortcuts you can work quite fast. I've worked with Cubase, Sonar, Nuendo, Reaper, Pro Tools... I don't really like to say 'best', but Logic certainly has many features that are very useful to me and the kind of work that I do. - What is your opinion about the value for the price? It's a bargain, no doubt about it! - Knowing what you know now, would you make the same choice? After some four years without releasing a new version it really looks like now the team behind Logic is working well. Unless some other software shows me something that really makes my life a lot easier, I don't see a reason to change it. The sound is good, it has more colors and is better made...even more intuitive. Logic 9 is way behind. 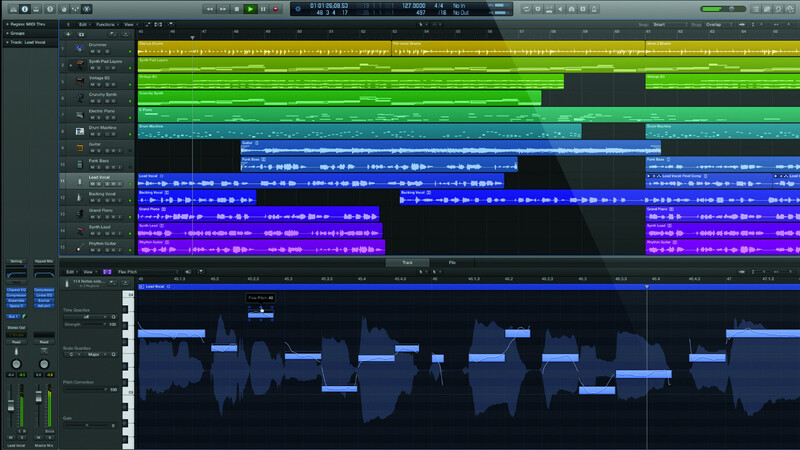 Apple has updated Logic Pro X, and this version 10.2.1 features numerous new features and enhancements.